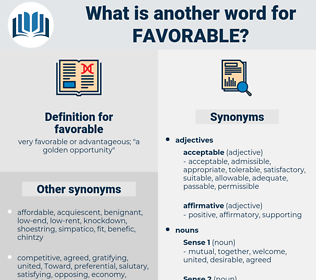 What is another word for favorable? very favorable or advantageous; " a golden opportunity"
best, unfavourable, favourably, Favoured, affirmative, congenial, convenient, desirable, fertile, sympathetic, comfortable, permissive, useful, proper, amenable, business-friendly, affordable, favored, superior, amicable, child-friendly, preferable, promising, virtuous, accommodating, rewarding, successful, viable, opportune, wonderful, soft, inappropriate, helpful. advantageous, preferential, concessional, profitable, hospitable, suitable, auspicious, benign, Concessionary, appropriate, excellent, expedient, healthy, adequate, attractive, privileged, strong, lenient. detrimental, hindering, hurting, bad, disadvantageous, unhelpful, unfriendly, hurtful, hateful, harmful, disagreeable, derogatory, unpromising, injurious. inappropriate, unsuited, unfitting, unsuitable, useless, worthless, improper, unacceptable. captious, warlike, uncomplimentary, faultfinding, fatal, contentious, caviling, overcritical, bellicose, belligerent, scornful, calamitous, inimical, frigid, gloomy, futureless, disaffected, slighting, depreciatory, disastrous, threatening, inappreciative, discouraging, unappreciative, unprofitable, alienated, disparaging, hypercritical, cold, unkind, dark, depreciative, critical, catastrophic, inconvenient, antagonistic, unflattering, estranged, disdainful, distant, contemptuous, belittling, indifferent, carping, disheartening, dim. displeasing, inopportune, leading, nonindulgent, strict. Ovington paused to consider the most favorable light in which he could place the matter. Each brought some such powerful argument to sustain their comparative claims to his favorable consideration. favorably, free fall, frivol, firefly, free people, four-ply, frivol away, favourable, froebel, fearfully, fair ball, fearful, foreplay, fire bell, friable, furbelow, fireball, farfalle, favourably, fire opal, fairy bell.